It is with pride that I write you to inform you about my successful Pacific Crest Trail speed record attempt. I’m Karel Sabbe, a 26 year old dentist from Belgium. The plan to run the PCT came into my mind about a year and a half ago, while hiking in New Zealand with my good friend Joren Biebuyck. The trail had always been on my bucket list, after a few visits of America’s West coast. Due to working obligations I would not have the time to hike the trail, but because I started running ultra distances the idea came to me to run the trail. I checked out the record, which was set by Joe McConaughy and it was at a pace of 50 miles / 80kms per day. This seemed hard but doable. 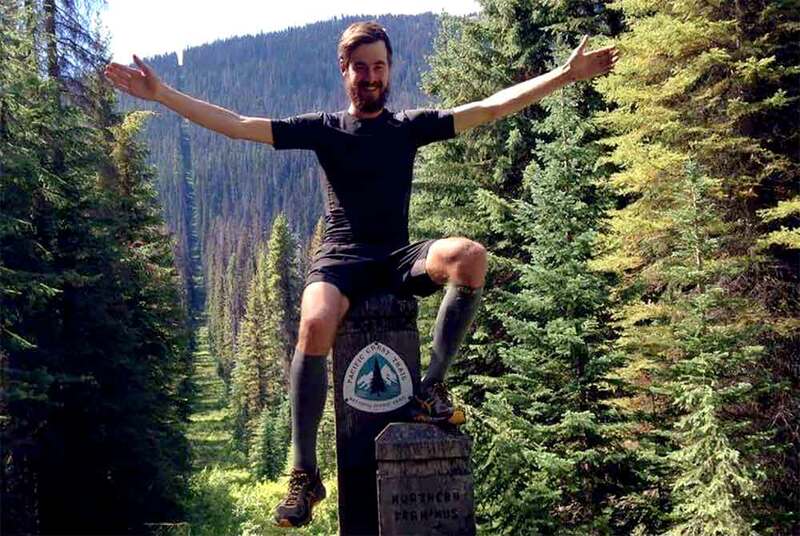 At that pace it took him 53 days and 6 hours to complete the 2650 mile long trail. Telling Joren about my consideration of running the trail he was immediately interested, as he knew my running potential was big. He’s a physiotherapist and from the start he was up for it and suggested he’d come along to be my support team. So the plan was there, and a few months later we decided to really go for it. I started training a lot, ran many hours a week and signed up for some though races to prepare for the challenge. The biggest part of my preparation was to compete in Morocco’s Marathon des Sables, the so-called “Toughest Footrace on Earth”. I wanted to complete this race to learn more about running in desert conditions and to be prepared for the multi-day aspect of the PCT record attempt and the running with a backpack. I completed the 6-day race successfully and finished 37th out of 1200 competitors, being best Belgian. I am very happy I did this race because the desert section of the PCT is very long, and very challenging. The experience I got during the MdS got me confident for that. In the end I ended up with “only” one heatstroke. I was hydrated enough but was overheating without realizing, not wetting my t-shirt often enough. I got sick and had to vomit a few times and had to call it a day. Other than that we crossed the dry desert section safely, but it did cost a lot of effort. Then came the high sierras, a region I had visited the year before as I took a month exploring them. It was nice to be in familiar and spectacular terrain, and we also knew that here was an opportunity to gain a lead on the current record holder Joe. He averaged a little over 42 miles in this section. With difficult access for Joren we decided on long and very hard days, but that way I would not have to run with a sleeping bag etc. and I could meet Joren every night. I did average more than 50 miles a day in this section. This got me to a day’s lead compared to Joe and I managed to keep this day’s lead to the very end. was desperate as I did not have food nor sleeping equipment and I was dead tired. In the end he woke her up, and she heated up my prepared meal, showed me my cabin and told me about the hot spring pool that they had in which I could soak. Or how a miserable day can end magically. Northern California was also hard with rough terrain and the feeling that the California section of the PCT was endless. Nevertheless, after 34 days I made it into Oregon and set a new record for the California section of the PCT. What was hard for me mentally was the expectation of an easy Oregon section. All hikers kept on saying: yes but in Oregon you’ll fly, etc. Oregon was definitely difficult as well and the terrain wasn’t that much easier than northern California. There were also sections with hundreds of fallen trees that weren’t cleared which slowed me down immensely. Then came a volcanic section with also very rough terrain to run on. At the end of Oregon I had my mental lowest moment. My feet were aching horribly and they were blistered and very damaged. I had to take painkillers for days in a row but would still run in great pain. The softer terrain of the Washington section made them heal up though, and with new mental power I was ready for the last stretch. Even four days of very bad weather couldn’t stop me, even though the heavy rain and wet conditions got me new blisters and as I had lost all my fat reserves I was very cold all the time and had difficulties keeping a good body temperature. The hardest night was when after a 54 mile day we realized the trail that Joren was going to take to meet up with me wasn’t maintained and possible to walk, so Joren had to walk in on a trail that was 16 miles further north on the PCT and that was a 7 mile hike in. He called with a satellite phone to inform me about this and we decided to go on through the night until we would run into each other. We ended up doing that right after sunrise at 6AM. Luckily it didn’t rain that night, and every time I was falling asleep while running/walking I laid down on the trail curled up and slept a bit until the cold woke me up and then I continued. We then slept for one hour and a half and continued the schedule as planned. 52 days, 8 hours and 25 minutes after leaving the Mexican border I arrive at the Canadian border, doing 22 hours better than the previous record set by Joe. The feelings that go through me are mixed and I cry and laugh at the same time, feel glad and sad. Most of all I feel proud of what Joren and I have accomplished. We finished the trail at about 51 miles per day and had a wonderful adventure.